08:05 a.m. Arrival to the capital of Uzbekistan by flight HY202. Transfer to the hotel. Check in the hotel and rest after flight. Lunch and rest in the hotel before a game. Game with a team of Uzbek football veterans.Transfer from the stadium to the dinner in “Bahor” restaurant. Transfer to the hotel. Overnight in Tashkent city. Breakfast in the hotel. Optional: city tour or free time. Lunch. 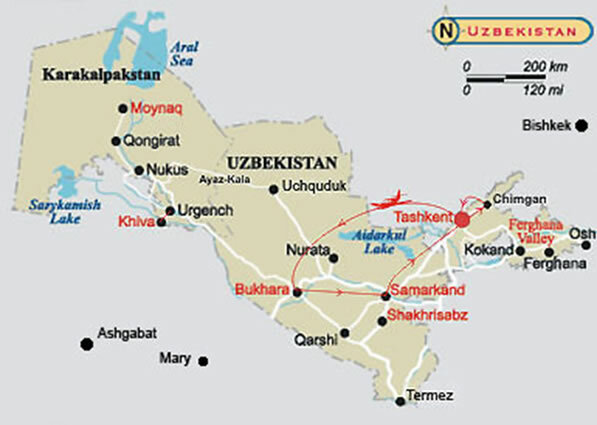 Optional: continuation of city tour around Tashkent or free time. Dinner. Overnight in Tashkent city. Breakfast. Transfer to Tashkent airport for morning flight to Bukhara HY1321 (departure: 07:30 a.m.). Arrival in Bukhara (09:15 a.m.). Accommodation and rest in the hotel. Optional: city tour or free time. Lunch. Game with a local Uzbek football team. Dinner. Overnight in Bukhara. Breakfast. Optional: city tour or free time. Lunch. Coach trip to Samarkand (270 km, 2.5 hrs). Accommodation in the hotel. Dinner. Overnight in Samarkand – capital of Amir Timur’s empire. Breakfast. Optional: city tour or free time. Lunch. Game with a team of Samarkand football veterans. Free time. Dinner. Overnight in Samarkand. Breakfast. Optional: city tour or free time. Lunch. Optional: city tour or free time. Coach trip to Tashkent (315 km, 4 hrs). Accommodation in the hotel. Dinner. Overnight in Tashkent. Breakfast. Transfer to Chor-su market, located in the old part of Tashkent city for buying of souvenirs. Lunch. Transfer to Tashkent airport for flight HY201 to London (departure 16:30).